Postcard DVD featuring beautiful Aroostook Scenes. A 17 minute miniDVD is attached to a postcard that can be sent as a greeting and a gift. 4 seasons scene. A Postcard DVD called "Greetings From Aroostook" featuring spectacular scenery, people and wildlife set to music. This novel item combines a mini dvd, which plays in a regular dvd player, and a postcard. The DVD includes the Million Dollar View south of Houlton to Ramsey Ledge in The Allagash. It's narrated by Layne Longfellow, relative of the poet. Great gift idea for friends and family. 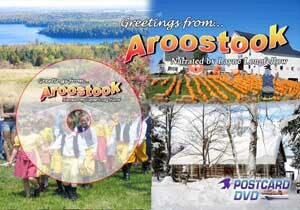 Our four seasons "Greetings From Aroostook" Post card DVD has been packaged for seasonal giving. The DVD, which begins with spectacular winter scenery from The County, is the same popular show narrated by Layne Longfellow. The only difference is the seasonal packaging. Now available as a full size DVD. 06.11.17 9:36 Design and hosting by WilliamLDuncan.com ©2017. Content ©2017 Crown of Maine Productions, Inc.